Harebrained Schemes has done pretty well for itself with the Shadowrun franchise, ringing up $1.8 million on Kickstarter for Shadowrun Returns in 2012, followed by the Shadowrun: Dragonfall expansion (and later, a stand-alone Director's Cut) and Shadowrun: Hong Kong, which is still in development. But in a recent interview with Game Informer, Harebrained co-founders Jordan Weisman and Mitch Gitelman suggested that the studio may move on to something new, that's based on something old. "There’s a very real chance of us pushing the size of the studio just a little bit more," Gitelman said. "What’s great is that we greenlit this original IP, Necropolis, but there are other IPs that we’ve created in the past that we are very interested in. Maybe soon." "We’re not going to say yet, but one of my old children may be coming home to roost," Weisman added. Those "children" almost certainly refer to either Battletech/Mechwarrior or Crimson Skies, and the smart money looks to be on the former. Harebrained tweeted a link to the Game Informer story shortly after it went up, which is no big deal, but then so did Russ Bullock, the president of Mechwarrior Online studio Piranha Games. 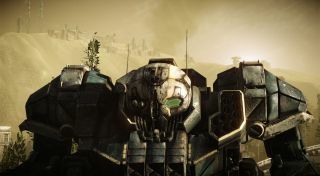 A Piranha Games rep declined to comment on the matter, but confirmed that the studio still holds the publishing rights to the Mechwarrior franchise, which it acquired in full last year following its split from former Mechwarrior Online partner Infinite Game Publishing last year. It might not mean anything—but then again, it might. We've reached out to Harebrained Schemes for comment, and will update if and when we receive a reply. Update: Unsurprisingly, Harebrained has also declined to comment. "We aren't prepared to talk about anything right now," a rep said, "but we are excited about the future and the chance to bring another one of Jordan's classic IPs into Harebrained Schemes where we can give it the love and care we've given to Shadowrun."